Pretty Pink Boutique Hair Bow adorned with a Hot Pink Gerbera Daisy. This two for one style hair bow is a great asset to your hair bow collection. The Daisy is on it's on alligator clip so it can be worn alone or slipped onto another bow. The pink boutique hair bow can also be worn alone too because it is on it's on French clip. 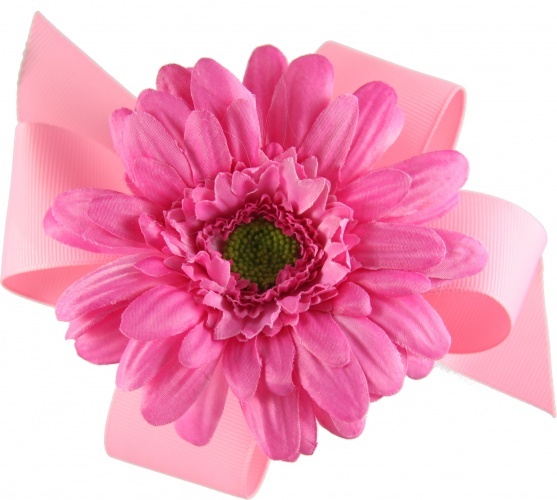 Or keep it together as shown above to show off your pretty pink gerbera daisy on a pink stylish bow.